Arrived in Midtown Atlanta at 6am (after an hour and a half sleep)… the restaurant (Shout) that the Performance footage was shot is beautiful. The room was transformed into something very beautiful. I ran out to ge the bass rig for the video and got back at about 9am as the musicians and extras had arrived. My good friend Jamie was cast as a violin player in the video and my friend Chris Francisco (formerly of Dezeray’s Hammer) was cast as the bass player. Today was a blast… but SOOO tiring… I got to be ashton’s “Stand-In” as he was in make-up and they were running through the song (for band practice and lighting). so there is some video footage of me playing and singing “Better Than I Know” with the band and extras on the set… it was awesome. 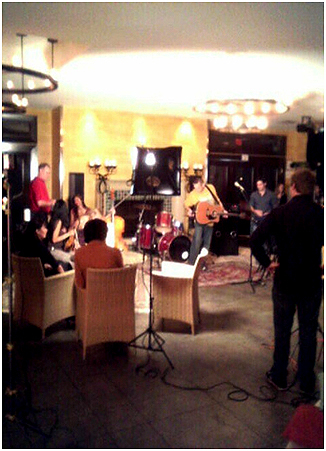 We broke around 4pm and started the long process of packing up… they had a few more hours of shots to do, but they let me bail on the evening so i could sleep and go to a show… I drove up to Jamie’s place (sandy springs) and took a much needed shower, then threw on clothes and headed down to the Red Light Cafe in Atlanta to see Brian Vander Ark of The Verve Pipe… . It was great catching up with him… but i was beat.. so after the show i headed home and grabbed a quick meal w/ Jamie before bed… we have a 10am call time tomorrow to finish shooting the video.